Moroccan authorities announced that 31 illegal migrants were rescued in the sea north of Morocco, while the smuggler, a Malian national, was arrested. On Monday, the bodies of 11 clandestine migrants were recovered. The victims drowned off the coast of Nador, in the northeast of the kingdom, following the shipwreck of their makeshift boat on its way to Spain. Morocco has seen an influx of migrants trying to reach Europe, most of them on boats bound for Spain. According to the latest statistics released by the UN Migration Agency, 82,100 migrants and refugees entered Europe by sea in 2018 through 30 September, with 36,654 to Spain, the leading destination this year. Deaths on the Mediterranean remain high, at 1,741. However, that figure is well below the death toll recorded at this time last year (2,676) or 2016 (3,602). 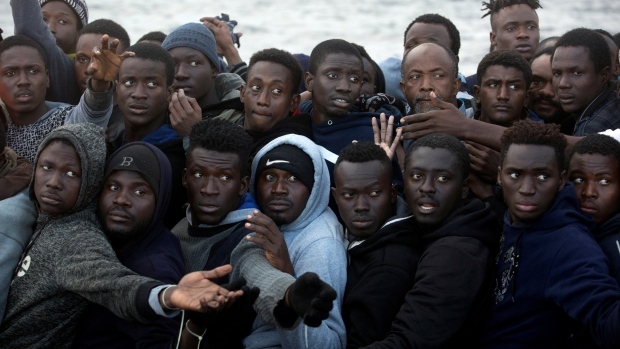 Spain, with nearly 45 per cent of all arrivals through the year, continued to receive seaborne migrants in September at a volume nearly twice that of Greece and more than seven times that of Italy, says the International Organization for Migration (IOM). Posted by Khalid Al Mouahidi on October 3, 2018. Filed under News. You can follow any responses to this entry through the RSS 2.0. Both comments and pings are currently closed.